ya the opera house burned down in 1991 as a matter of fact i have video tapes from the first second smoke started showing from the front windows before the fire department arrived the smoke was so thick and black the fire fighters never stood a chance and most of them grew up around the building so they all knew how bad and unsafe the interior was and the fire started in the early afternoon not the night and burned for 2 days not 9 hours and the fire departments that were there trucked water from sandusky and carter well drilling south of town. Actually it was plowed down and covered over but it was in between the house just south east of the bar and north of Midwest Construction which is next to Main Street General Store and is used by Midwest Construction for parking equipment. If anyone needs old maps I have them and I live 3 blocks from there. 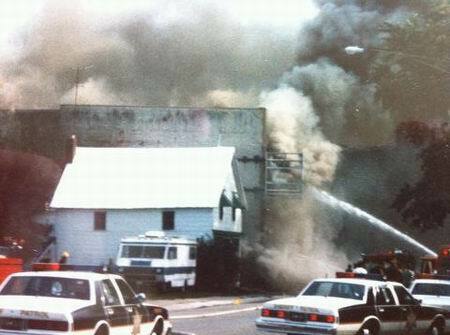 It burned down on Tuesday, August 20, 1991. It was located at 45 South Main Street. It was built in 1916. When it burned, the 5 fire departments called to the scene stayed there fighting the fire for 9 hours (4:30 pm Tuesday to 1:15 am Wednesday) and in the meantime, drained the towns 110,000 gallon water tower on it and had to drive north of town to pump water out of a private pond to compensate. The buildings owner, a Eugene Wilson, told authorities that there was only 4 to 6 barrels of cyanide located in the ruins of the structure. They eventually pulled 100 barrels of cyanide out of the wreckage (83 barrels out of the basement and another 17 barrels sitting behind the place). The destruction of this structure pretty much marked the death of Carsonville. The untimely departure of the Opera House left a huge void downtown, a year later, the independent hardware store down the street folded, as well as the huge grain elevator on the west edge of town a few years after that. The opera house had urethane resin inside because in addition to the junque inside they were manufacturing floor mats to be used in shops for the workers to stand on. I live about 12 miles to the north, and the smoke and red glow from the fire were amazing even from here. There was an Opera House in Carsonville located on Main Street on the east side of the street. It was a three story brick building, it had a bowling alley in the basement and there were screenings of silent movies on the second floor. It was turned into a junk shop/build your own Tiffany lamp store and renamed Ye Olde Opera House in 1982. One night in 1990, it caught on fire. The fire department sat back and watched it burn because for some reason there were 55 gallon barrels of Polyuathane sitting in the place systematically exploding. God forbid anyone rebuild anything, the wreckage was plowed over and the lot is now a parking lot for the Carsonville Hotel (Bar) across the street.